An amazing 16" party pack themed around action animals including cheetahs, lions, wolves and more! This party pack includes many of our favourite Make Anywhere Bear kit lines and comes complete with everything needed to host a bear making birthday party for 10 children. Each pack comes complete with 10 bear and animal skins, 10 packs of stuffing, 10 wish-upon-a-star charms, 10 birth certificates and 10 deluxe carry bags. 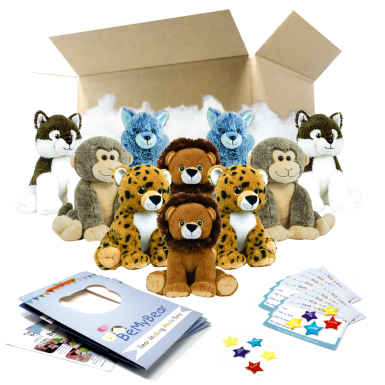 The bear/animal characters included in this pack are: Blue Fox (2), Cheetah (2), Sir Roaralot (2), Monkey (2) and Wiley Wolf (2).